August 7, 2013 /0 Comments/in Shoe Odor /by Jenn F.
Foot odor is caused by bacteria. Sweat and dead skin cells are the fuel that drives the bacteria to feast and flourish. As gross as that sounds, there are ways to cut down these factors to leave your feet softer, healthier — and better smelling! Salon pedicures can cost $25 and up, but you can get the same effect at home with a little bit of time and a few tools. 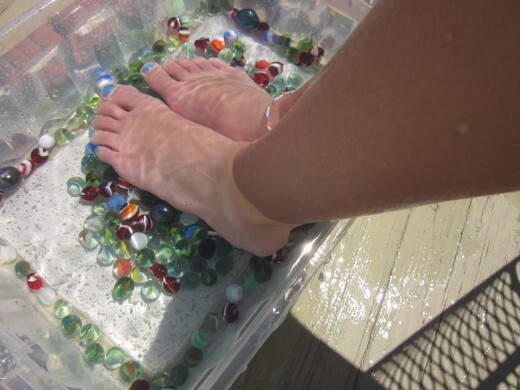 – Rub your feet over marbles in the foot bath for a massage. – Paint your nails with a base coat and allow it to dry before adding a topcoat. – After about an hour, coat the feet in a thick lotion, put cozy socks on and enjoy your baby-soft feet! There is no reason to live with malodorous feet. We’ve discussed many different tactics, such as: wearing special insoles, choosing sweat-wicking socks, eating right, de-stressing, and seeking medical treatments like Botox, anticholinergic drugs, shockwave therapy or hyperhidrosis surgery. You may find it helpful to change your socks more than once a day, especially after a long work day. Some people use foot sprays and powders, but we find that to be just as gross as sweaty feet because you’re either soaking your foot in a chemical foot bath or baking your foot in a soggy cake of deodorizer. Instead, we feel it’s beneficial to use a UV shoe sanitizer to eradicate up to 99.9% of bacteria and fungus living in your shoes. How Does The SteriShoe UV Shoe Sanitizer Work To Stop Foot Odor? It’s not enough to pamper and clean your feet if you’re planning on sticking your feet into filthy shoes. The SteriShoe sanitizer destroys microorganisms using a germicidal UVC lamp like they use in hospitals and water treatment plants. Up to 99.9% of the harmful bacteria and other microbes are killed when directly exposed to the UVC light for one 45-minute cycle. 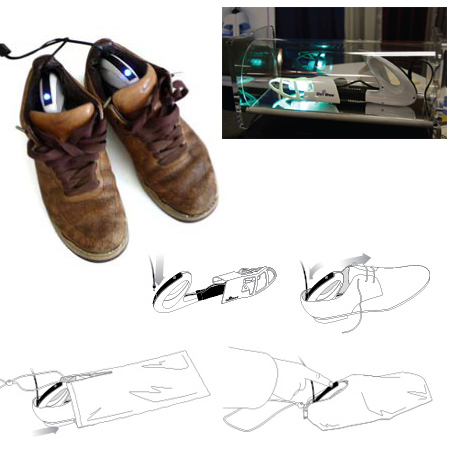 You simply insert the SteriShoe device into your shoes — as you would insert a shoe tree, stuff the shoes into their protective bags, and press the button. This device is a “must” for people who have battled foot odor, toenail fungus, athlete’s foot or diabetes.